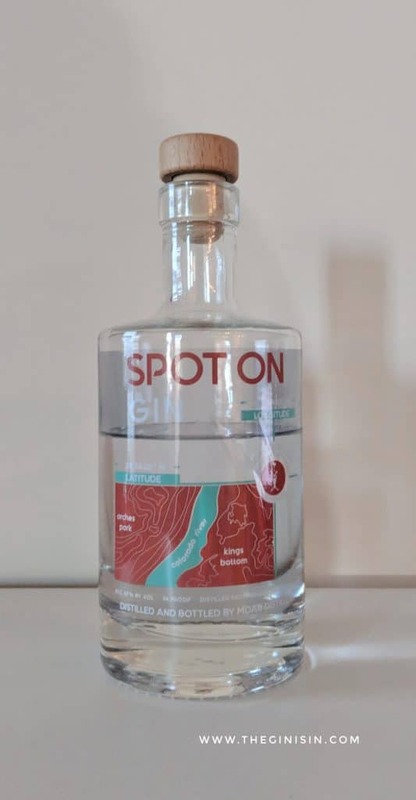 Spot On Gin is distilled out of the Moab Distillery in gorgeous Moab, Utah. If you’re not familiar with Moab— you might be more familiar with Arches National Park— one of the most iconic settings in the U.S. if not the world. As if that’s not enough striking beauty, there’s also Canyonlands National Park— right across the street. Seriously, Moab is incredible. Utah isn’t known for its love of spirits. The state has some of the most restrictive liquor laws in the country to this day. Religious influence on government has kept bars and cocktail programs operating with arcane prohibition era restrictions; however, distilleries have begun to blossom across the state. Moab Distillery arose out of the well-established Moab Brewery. It was only in the late 2010s that they expanded to spirits, beginning with the launch of their Class 5 Vodka. Spot On Gin refers to a very specific point: 38.5626º N Latitude, 109.5493º W. Longitude. Spot On Gin begins with a bit of mentholated herbs and pronounced-base spirit aroma. Sage, tarragon and nori dot the nose, with a fair amount of grain. Spot On has a bit of a genever character, especially at first whiff. The palate is a noise mix of citrus, juniper, base spirit character and vague herbal spice. There’s a leafy, green, and moderately stewed aroma that turns intensely mentholated towards the finish. You’re going to get a residual spearmint coolness on the edges of the palate. Which on its own, isn’t a bad thing; however, unfortunately Spot On Gin can’t seem to shake this cooked greens note that pervades the whole palate. There’s moments where floral note breaks in, but it never seems able to lift Spot On Gin out of the darkness. Notes of mushrooms, cubeb pepper, asparagus and spearmint lend the whole thing a soupy flavor-profile with a rough heat-kissed finish. Spot On Gin is a bit of a tough mixer. I suggest mixing it with bolder ingredients. For example, it works more succesfully in a 1:1 Martini than a Dry Martni; better in a Dirty Martini than a Pascal Martini; better in a Negroni than sipped neat. It can be treated as a Holland-style gin when mixed because there is ample base-spirit character. I wasn’t able to find a Holland style gin cocktail though where it worked as well as hoped. It’s hard to find a lot about Spot On to warrant a recommendation. I started with their vodka, which I think honestly makes a good starting point. However, the botanicals are stewed and out of balance. While you can find notes or moments in Spot On Gin that hint it might be on the right track— ultimately it just underwhelms as a gin.